Because Highland’s worship observes the rhythms of the church liturgical year, we gather for worship in unique ways throughout the year to mark special parts of our Christian story. Through the creative leadership of the Worship Ministry Group, these times of worship are favorites for many of our members and visitors. 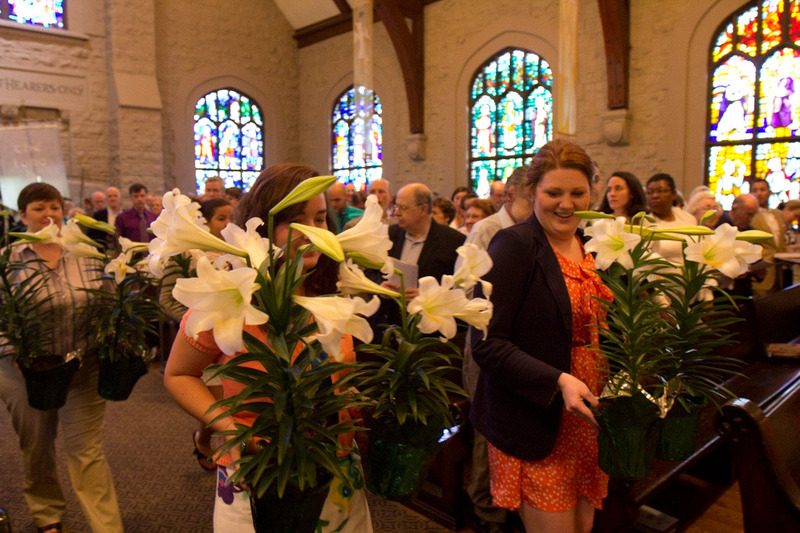 They allow us to step outside of the familiar cadences of our weekly worship to recognize these significant seasons. Brief descriptions of a few of our special seasons and the services of worship that mark them are listed below. 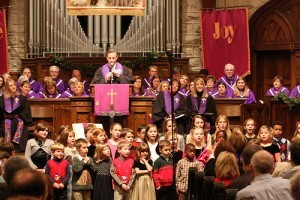 Highland’s four-week season of Advent prepares us for the coming of the Christ child. On the first Sunday of Advent, Highland’s Hanging of the Green service gives space for us to transform our Sanctuary with the colors, sounds, and symbols of the Advent and Christmas season. The second Sunday of Advent is Peace Sunday, a time where we place Crosses on the Lawn as our community’s public lament of acts of violence that disrupt Christ’s peace in our community throughout the year. During the fourth week of Advent, we gather for worship on Christmas Eve in two candelight services that help us mark the coming of the Christ child through stories, carols, and the sounds of Christmas. The celebrations of Christmas are carried throughout the weeks that follow Christmas day. Observed by millions of Christians around the world, the season of Lent is recognized at Highland through acts of personal sacrifice and self-reflection. Our members are encouraged to make an intentional turn inward to examine their spiritual lives during this season representing Jesus’ time in the wilderness. The 40-day journey that precedes Easter culminates during Holy Week, the final week of the Lenten season. A Contemplative Service on Wednesday allows us space to rest in the quiet of God’s presence. Our informal Maundy Thursday service is one of readings and stories, inviting participation by everyone there through a time of hand-washing and communion. The drama of Good Friday is felt through the Tenebrae Service, where we gather in a darkened room and journey through Jesus’ final moments of life. Darkness gives way to light on Easter Sunday in three morning worship services that are the emotional and theological center of Highland’s worship experience throughout the year. 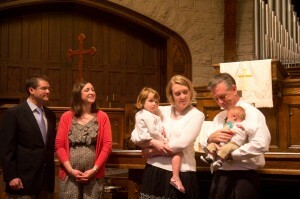 Highland is a community of faith rooted in the Baptist tradition. Because of our Baptist heritage, we come as we are, bringing our full selves to the communal experience of worship. Throughout the year, we mark rites of passage and celebrate the rituals of our faith that give shape and meaning to our worship. Baptisms are Highland’s primary way to recognize as a community the outward sign of God’s invisible grace that happens when one becomes a believer and follower of Christ. Once a month, we remember the life and death of Christ through communion, a practice of sharing the bread and the cup together at a table where all who are children of God are welcomed. Highland covenants during baby dedications to be the village that helps raise each of our children, teaching them the stories of Jesus and the songs of faith. From time to time, groups from our church go away on mission, beloved friends move away, our folks start new journeys of their lives. We mark these moments by sharing prayers and words of blessing, living out our calling to actively be community with one another. Even as each person is called by God to live out the Christian life in the way of Jesus, certain of our community are uniquely called to the ministry. We celebrate these callings of our Deacons and ministers through services of ordination, marking through worship the end of a process of discernment and prayer and enabling the congregation to extend hands of blessing to the one(s) being ordained. 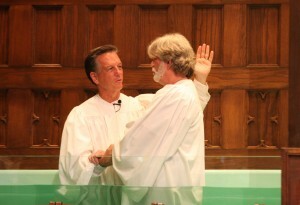 For more information about Highland’s special services of worship, contact Kathy Collier.